Osaki provides technology with endurance. It has the sheer advancement in the technology of human body scanning that its massage chairs are almost accurate to every point of the back as well as the whole body. Even after a huge price variation in the massage chairs that this manufacturer provides, there is a huge demand of this product in the market. The Osaki 7200H is an updated version of Osaki OS-6000. With the technology in OS-6000 the S track rolling technology provides a more consistent massage throughout the back. 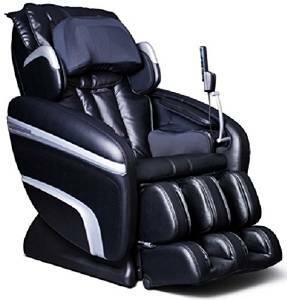 The OS-7200H model is equipped with twin rollers which work in synchronization to each other and make the massage feel like a touch of human thumbs pressed against each other, enhancing the massage experience. The multi staged zero gravity positions allow the user to minimize the vertical pressure on the spine axis and make the zero gravity feeling even more weightless. The leg area has a special leg scan feature which helps the chair to identify the leg and calf areas to provide the pressure from the air bags to just the right pressure points to avoid any painful squeezing. The music player has a really amazing feature of music sync which synchronizes the massage vibrations with the music played according to the pace of the music. The massage chair with twin rollers usually is very heavy but this model is quite light as compared to them. It weighs only 225 pounds and can be installed and moved around the house by one person only. Exclusive extended warranty is provided by the sellers on this product which shows the risk they are ready to take about the product. This clears out the slightest doubt about the durability and long lasting performance of the massage chair. The color selection has to be made after the order specially by calling the back store or through email. This increases the work load on the user and takes away the leisure of having a visual of the chair in that particular color. As much as the chair provides a scanned leg massage, it still turns out to be a pressure on and off of the legs of the user. Most of the time the scanner does not judge the points of the calves and leads to a rather painful or lighter massage at some points. The chair even though is a full body zero gravity massage chair, has full functionality only in the neck, shoulder and back areas. The arms and legs are just tending to be squeezed by the air bags from both sides. If you want to buy this chair, a preferable choice would be to go for it for the cheap price that is $3,795 and the warranty that covers all the rock solid parts and the labor work by default too. The people with a focus to the neck shoulder and back massage will not get a better 3D technology zero gravity massager with such precise heating feature. And at last the twin rollers give a human masseuse like feeling which is a really good up for this product.